Global technology leader and lubricant manufacturer, ROCOL®, has secured a key agreement with the world’s leading shiplift company. TTS Syncrolift which manufactures 90% of all shiplifts worldwide, has appointed ROCOL as its recommended lubricant manufacturer. Norway-based TTS Syncrolift is part of TTS Group, a global organisation that designs, develops and supplies equipment solutions and services for the marine and offshore industries. 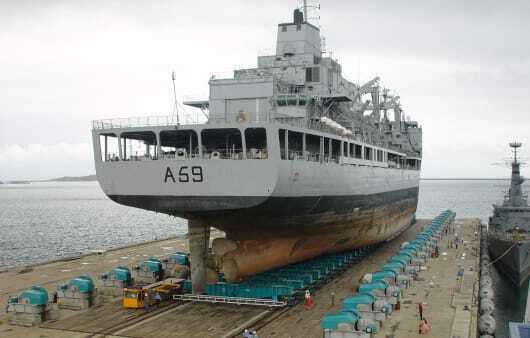 ROCOL products will be applied to all new build shiplifts by TTS. TTS Syncrolift recognises the value of ROCOL products and their long-term value in terms of equipment life extension, downtime reduction, safety, efficiency and environmental standards. ROCOL products will be used on wire ropes, gear boxes, open gear equipment, bearings and pins deployed by TTS. The products to be used include BIOGEN WIRESHIELD®, WIRE ROPE Dressing, SAPPHIRE® Hi-Torque 220, TUFGEAR UNIVERSAL and SAPPHIRE 2. BIOGEN WIRESHIELD® is the most advanced wire rope lubricant in the world, providing industry leading corrosion protection; a unique pseudoplastic penetration system and exceptional water wash off resistance, even in submerged conditions. The product has also been independently verified to meet European Ecolabel standards, proving its ability to minimise negative effects on the environment. Established more than 130 years ago, ROCOL is a manufacturer of lubricants and associated products across a number of sectors including the offshore, marine, automotive, aerospace, industrial, food and drink, transport and mining industries. A leading supplier of shipyard production technology, heavy load handling and shipyard consultancy, TTS Syncrolift is based in Holterkollveien, Norway. The business has developed systems for handling, launching and docking purposes. It offers a wide range of products for efficient block and ship transfer systems, as well as shiplift and slipway systems. TTS Group has a worldwide network of branch offices, service stations and agents. It provides after sales services covering the major shipping regions of the world. UK-based ROCOL has 12 offices worldwide. For more information about ROCOL and its products, contact customer.services@rocol.com or phone +44 (0) 113 232 2700. Team ROCOL take the Leeds 10K Corporate Challenge!